I always enjoy the opportunity to field test a new shotshell in advance of the fall waterfowl season. I was contacted by Environ-Metal this spring to test and evaluate its new product, Hevi-Metal. The test event was a Minnesota snow goose hunt with my old partner, Todd Gifford, of Hastings, Minn. Environ-Metal dropped a few rounds of Hevi-Metal on my doorstep, and it was off to the test location. The load is a half-and-half charge of common iron shot pellets, with a second charge of tungsten iron shot. For example, if the load is a No. 2 steel shot pellet, the second half of the load is a No. 4 or No. 5 tungsten Hevi-Shot pellet. The smaller pellet equals the weight of the larger iron pellets, and because the tungsten portion contains more pellets, the total shot count of the new load increases. 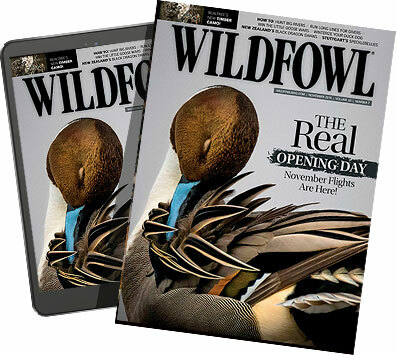 The primary reason the new load was developed is to allow hunters to shoot Hevi-Shot waterfowl ammunition at a reduced price. It is a breakthrough for hunters who gravitate toward Hevi-Shot when selecting waterfowl loads. With the test fodder and the rest of my hunting gear loaded, I headed toward Minnesota's state line to meet up with my hunting buddies. The camp was ready when I arrived, and Gifford had done an outstanding job of scouting birds. The next morning, I settled into a layout blind at first light. The group of hunters including Gifford elected to hang with me and shoot the new loads in BBB/No. 2. Upon performing a quick cut-and-count test, I found the test loads had come up a bit short in the correct pellet count numbers. The problem was later reviewed, and had occurred because of an error in handloading by Environ-Metal just before the hunt. The minor blunder was apparently no big deal, because as the first flock of geese dropped into the decoy spread, five guns loaded with Hevi-Metal sang, and seven birds fell from the sky. Hevi-Metal choke constriction table: 30-inch circle @ 40 yards. Price: About $25 per box. During the next two days, we managed to pull down enough birds to give me a clear indication the new shot combination had merit as a tungsten/iron shot field load option. Cripple numbers were acceptable in terms of the number of birds we downed, and kills were often quite clean. However, it was very difficult to determine the birds that died from tungsten versus standard iron shot. The sure thing was they did die, and that is the bottom line in terms of calculating load performance. When I returned home to my South Dakota test range, I found more fodder waiting for me. New loads in the Hevi-Metal box design arrived in No. 3s, 2s, BB and BBB. Upon performing a new hand count check of the No. 2 shot size, I found that the steel No. 2s counted out to 112 pellets, and the tungsten shot at about No. 4 through No. 2 in size counted at 71 pellets. This gave the load a total pellet count of 183 pellets, and just over 11â„4 ounces in payload weight (38.6 grams). A single charge of No. 2 steel counts out to 156 pellets at 11â„4 ounces payload weight. The higher pellet count gives the new, and now commercially packaged Hevi Metal load a 27-pellet advantage in terms of sweating up the core pattern. Using the Champion ATK mallard duck target and 30-inch circle, the new load, via my Winchester Super X3 and Clearview choke, plastered the 40-yard target with a solid 97 percent pattern. Almost 68 percent of the pattern fell into the inner 20-inch core, which indicates the No. 2 steel shot/No. 4 tungsten mix was without question effective to at least 55 yards. During the next few days, I patterned No. 3s, and found them to produce deadly core concentrations of shot, too. When I checked the spent wads -- and later a cut-down load with the wad removed -- it was obvious Environ-Metal had turned to an old-school method of creating tight core patterns. In this case, the wad and its four petals had been cut only 50 percent of the wad body length. This increases the hang time regarding separation, and ensures the shot will be retained in the wad as the whole payload moves out of the gun barrel and downrange. Hevi-Metal pattern board tests resulted in deadly core concentrations of shot at 40 yards. Often during pattern testing when using my Clearview modified choke, I found the wad at 40 yards would pass cleanly through the center of my 3â„8-inch target backer. It became evident that, even at 40 yards, some shot was staying with the wad all of the way downrange. Recovery of spent wads indicated that indeed, even after passing through my target backer and coming to rest, pellets were still trapped in the base of the wad. By turning to my own Dead Ringer wad stop choke system, I was able to get the shot to clear the wad quickly, which allowed the pattern to develop into a uniform 30-inch, full-choke spread with a contact count of 78 percent for close-range work. Payload control will be an issue to keep in mind when working with this new load in the field. For the most part, the patterns are going to run very tight. d the payload together, or open it up, thus increasing (or decreasing) core pattern performance. I have witnessed the drafting effect with the aid of high-speed photography. The evidence shows pellets lining up behind one another in even a single shot size payload during flight downrange for as far as 25 yards. At times, a slower pellet flying in the rear of a column will push past a faster pellet because of the slipstream effect. The effects are random, but still somewhat predictable when all the evidence is confirmed. What turns the drafting theory on its ear and adds more questions to the whole review process is when I weighed the tungsten No. 2 pellets, I got a figure of 5.6 grains, and the BBB steel come in at 7.4 grains. The BBB steel retained more weight, but the No. 2s in tungsten were denser for their size when compared to common iron shot. One of these pellet types could be producing a drafting effect. For now, it is a mystery as to which one, if any, is doing the air breaking work ahead of the pack. Lacking a uniform weight and size, there is without question, two pods of shot making the trip downrange. After reviewing the results gathered in the field and on the range, my first reaction to the new load is yes, it has merit in terms of making a splash among hunters required to shoot non-toxic shot. Just how much of an effect? First, the price can't climb out of sight. Many manufacturers have indicated during the onset of a new shotshell project that the price was going to stay affordable. Yes, that's true, but only if the marketing game is played on the same level for all parties concerned. If the retail folks increase the load price because they can obtain them at a bargain, nothing much will change in terms of moving along a load designed to save hunters money. I can't count the times I have seen manufacturers introduce new, low-cost loads, only to find them with a high price tag when the load hits the store shelves. Second, it will have to develop a track record among hunters as a clean killing system. My abbreviated snow goose field-testing shows promise, but a full season or two in the field will be the true test.